Few Viking Age weapons survive, and scarcely any survive in a pristine state. Most of the surviving weapons were grave goods, and virtually all of them were underground or underwater in the intervening centuries. Stored under these conditions, the wood and leather rot, causing the grip and its fittings to disappear. The iron rusts, causing the blade to erode, especially in the vicinity of thin or pointed features. When looking at a historical blade, it can be hard to imagine what it might have looked like 1000 years earlier when it was new. The photos on this page compare a historical artifact to a reproduction of the same artifact, making it easier to visualize the weapon's original appearance. The original is a sax blade in the collection of the Higgins Armory Museum (accession number 238.97), and it has been dated to the 7th century. (Since there is no context for this find, the dating is conjectural, and my personal opinion is that the date is too early.) The reproduction was made by Peter Beatson at Birka Traders based on this historical artifact. The sheath and fittings are based on 10th century examples. Even if the blade were as old as 7th century, it would not be surprising to find later fittings on the blade. 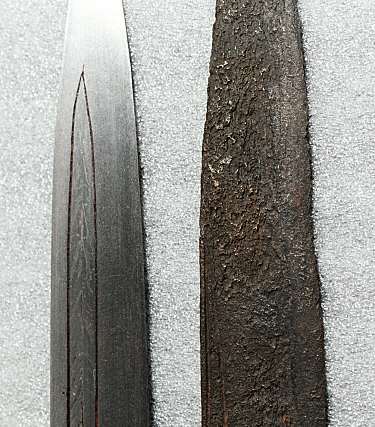 Blades were so valuable that they were used for centuries, and there are examples of blades where the age of the blade and the age of the fittings differ by 300 years. The long handle is based on the so-called "hunting knife of Charlemagne" (which has an 8th century blade with 10th century fittings) and is held in the treasury of Aachen cathedral. The reproduction grip is made of wood with a brass cap. The sheath is made from embossed and painted leather and is based on an example found in Trondheim. Reference: Okasha, Elisabeth. "Anglo-Saxon Inscribed Sheaths from Aachen, Dublin, and Trondheim." Medieval Archaeology 36 (1992) p.59ff. I present these photographic comparisons with few comments. The pitting and erosion of the historical blade are obvious in the photo. One observation that is not apparent in the photos is the feel of the blade. When handling the original, one gets the impression of a crude, unbalanced lump of iron. The reproduction is surprisingly well balanced and is a handy tool and useful weapon. I suspect that, when new, with all its fittings, the original was, too. The historical Viking sword shown above was ritually "killed" by folding the blade in several places. The fold in the tang broke, and at some point, the original crossguard for the sword was lost. 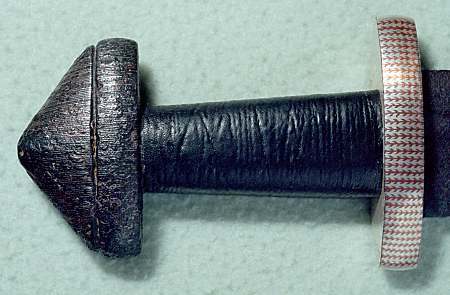 A new crossguard was fabricated, following the same inlay pattern used for the historical pommel, as described in the Hurstwic web article on Viking sword hilt inlay. The new crossguard gives a sense for what the pommel might have looked like when new. The striking herringbone pattern covered the entire surface of the pommel with fine inlaid copper and silver wires. The replacement crossguard was made by Jeff Pringle, swordsmith.